Cook County Commissioner Richard Boykin announced Thursday he will seek reelection to his commissioner seat, deciding against challenging Cook County Board President Toni Preckwinkle. “After some deep soul searching and careful consideration, I’ve determined that my part my highest and best use as a public servant is to run for reelection as a Cook County commissioner for the 1st District,” Boykin told dozens of his supporters and reporters at a press conference held in Oak Park. The first-term commissioner, whose district includes a good part of Chicago’s West Side, had been considering a challenge to fellow Democrat Preckwinkle after weeks of debate and controversy over the unpopular soda tax the board passed earlier this year. “This is a course of action I seriously considered,” Boykin said of his interest in running for the top spot on the 17-member county board. In recent weeks, he had been collecting petition signatures for that post as well as for his 1st District commissioner seat; signatures are needed to get on the March 2018 primary ballot. “The people of the 1st District deserve then as they deserve now leadership that puts people above politics,” Boykin said. Candidates cannot run for both board president and commissioner at the same time, meaning Boykin would not remain in office if he failed to defeat Preckwinkle, who’s expected to seek a third term as board president. “The board president again and again faces revenue shortfalls because of an unwillingness to seriously consider systemic fiscal reforms,” Boykin said. He said he would be committed to working on economic development, job creation and public safety in the communities that he represents. In an email Friday, Frank Shuftan, a spokesman for Preckwinkle, called Boykin’s proposals “vague and general,” adding, “Commissioner Boykin has proposed a road map in need of an actual map,” he said. After the press conference, Boykin told the Chicago Tribune that Congressman Danny Davis, for whom he served as chief of staff before being elected in 2014 to the board, had counseled him not to challenge Preckwinkle. Still, some Thursday expressed disappointment that Boykin won’t be challenging Preckwinkle. “I’m very disappointed in the decision that Commissioner Boykin made today, but I’m supportive and hopeful that he would continue to fight,” said Rev. Ira Acree, pastor at the Greater St. John Bible Church. “As the pastor of this community in the 1st District, I want to express my appreciation for this leader being the vision – one who has not been tentative or afraid to raise issues that affect us every day,” Acree said. Rev. Marshall Hatch, pastor of the New Mount Pilgrim Missionary Baptist Church, said the commissioner has been a voice against the inequities that disproportionately impact people on the West Side. Other supporting Boykin include Ald. Emma Mitts (37th) and Ald. Chris Taliaferro (29th). Cherita Logan from Davis’s office was also present Thursday to deliver an endorsement from the congressman, who was in Washington, D.C.
“I’m here making sure our citizens have everything that they need from the county government,” he said, adding he would continue his fight to repeal regressive taxes, including the sweetened beverage tax pushed by Preckwinkle. A repeal vote is scheduled for Oct. 10th. 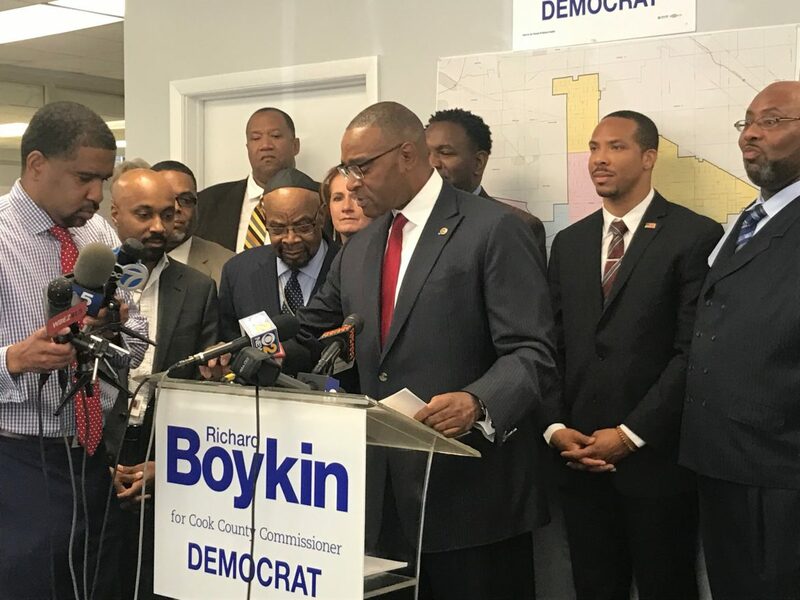 Although there’s no other declared Democratic or Republican candidates for the 1st District seat at this point, Boykin said he will be prepared for what’s to come.